Tagghiarini cu fasolu, as we call it in Sicilian is my mother’s take on pasta e fagioli. This is a classic Italian example of ‘cucina povera’. Commonly served during the winter months in Sicily, this is the ultimate comfort food! 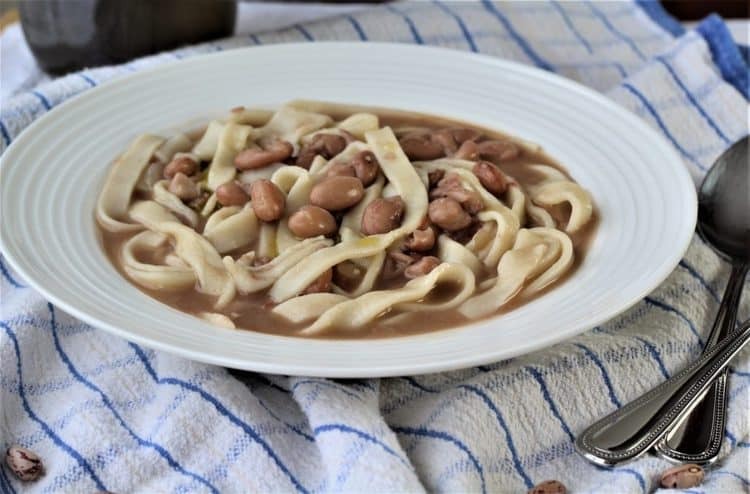 Tagliarini with Beans or Tagghiarini cu fasolu in Sicilian , is my mother’s pasta e fagioli recipe. When I was younger I did not like eating beans. Each time my mother made this dish, I’d make a huge pile of beans on one side of my plate while I devoured the pasta. Thank goodness I’ve long since gotten over my aversion to beans! The ultimate Italian comfort food! My mother makes the tagghiarini just a little bit thicker than your typical pasta. As a result they have a satisfying bite to them. Occasionally a few of them stick together when cooking and I would intentionally fish those out ’cause I love that chewier texture. Combine that with the creaminess of the beans and I’m in heaven! This is definitely not the most elegant dish but it is a classic example of cucina povera or peasant food. It is the ultimate Italian comfort food. Tagliarini with Beans is even better eaten the next day. The pasta is cooked in the water that you cooked your beans in, so the starch in the pasta combined with the beans creates a thick, creamy, smooth texture. In fact, I like to cook the tagliarini and let them sit a while before serving to get that texture I love. 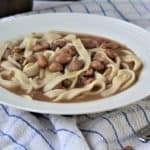 Can I use canned beans to make Tagliarini with Beans (Tagghiarini cu fasolu)? You can’t use canned beans to make this recipe since you need the cooking water from the beans in to cook your tagliarini. So you’ll have to make sure you soak your beans overnight before cooking. Until recently my mother almost always used beans from her own garden but we now use dry romano beans. You’ll note that the recipe only uses one egg which is much less compared to most pasta recipes. This results in a paler colored pasta. I used my pasta maker to roll the dough and then used the attachment to cut the sheets into tagliarini. It’s preferable not to roll the dough until the thinnest setting. I prefer a slightly thicker, chewier tagliarini so I stop at the third to last setting. Alternately, you can roll the dough with a rolling pin. Then fold the pasta sheet into thirds and use a sharp knife to cut approximately 1 cm wide strips. You can also prepare your tagliarini ahead and freeze them to cook at a later date. They do not require defrosting, simply drop them into the boiling liquid to cook. Unlike all other pasta dishes we never serve this dish with cheese. A light drizzle of good quality olive oil is all that is necessary before serving. We still have several more weeks of winter left and indulging in a nice comforting bowl of Tagghiarini cu Fasolu will definitely help you make it to spring! Let me know how much you enjoyed this dish by tagging me with your photos with #mangiabedda or @mangiabedda on Facebook and Instagram. Buon appetito! 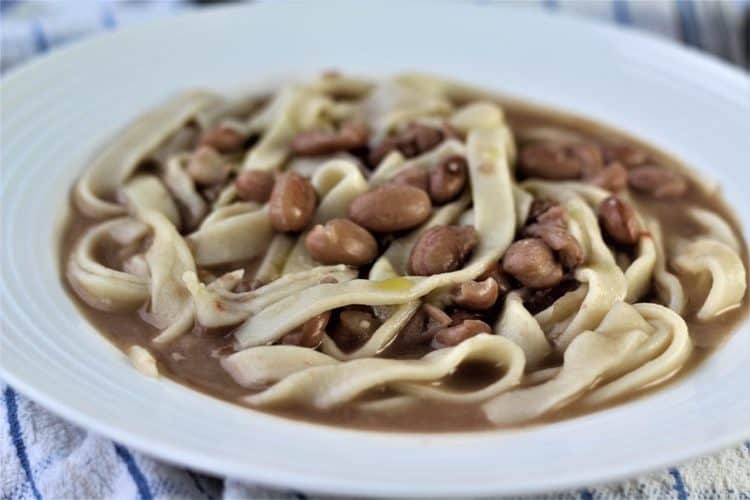 Tagliarini with Beans, or Tagghiarini cu fasolu as my family refers to this dish, is the ultimate peasant comfort food. This is my go-to pasta and fagioli dish! 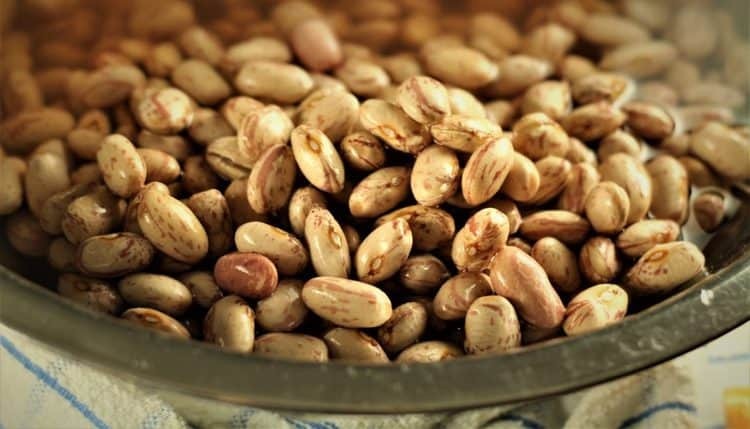 Place beans in a large bowl, cover with water and soak overnight. The following day, heat olive oil in a large pot and sauté onion. Add the chopped tomato and cook a few minutes. Drain and rinse the soaked beans and stir into the onion-tomato mixture. Cover with 12 cups of water and bring to a boil. Lower to a simmer and cook, covered, approximately 1 1/2 hours or until tender. Add salt, to taste. Meanwhile prepare the tagliarini. Place flour in a mound on a clean surface. Make a well in the centre and pour in the egg and 1/2 cup water. Using your fingers, gradually incorporate the flour into the egg mixture and knead to form a dough, about 5 minutes. If the mixture is too dry add 1 tbsp. of water at a time until the dough holds together. The dough must not be sticky. When a smooth dough is formed, flatten into a disc, cover in plastic wrap and place in the refrigerator for half an hour. Cut the chilled dough into 4 pieces. Flatten a piece of dough with your hands, lightly flouring both sides. Run the dough through the pasta maker with the flat rollers set to the widest setting. Run the dough twice at each setting until the sheet of dough is approximately 3 mm thick. I roll up to the third to last setting on my pasta maker. Cut each sheet into 3 and cover with a dish towel to prevent from drying while you roll the remaining pieces of dough. Using the attachment to cut the pasta sheets into strips, run each piece through the machine to form tagliarini. 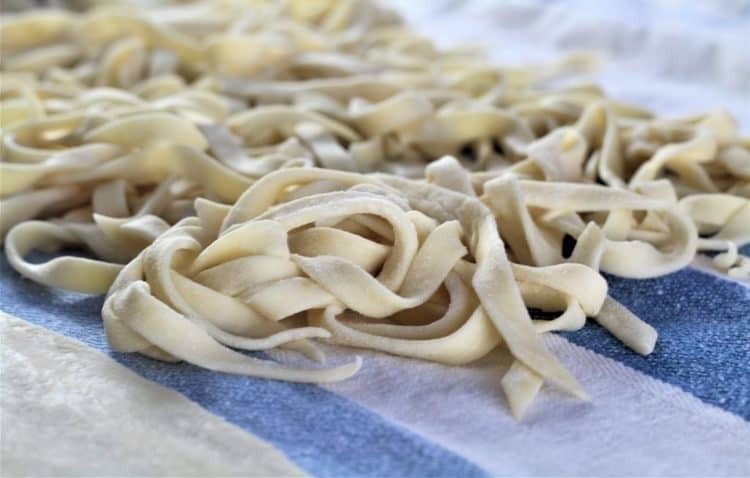 Alternately, you can use a rolling pin to flatten the dough into thin sheets, then fold into thirds and using a sharp knife cut tagliarini strips that are approximately 1 cm wide. Loosely place the tagliarini on a dish towel and dust lightly with flour to prevent from sticking. When the beans are tender, bring the liquid to a boil and add tagliarini. Cook until al dente, about 5 minutes and salt, if necessary. They are now ready to serve or if you prefer a thicker, creamier texture, turn the heat off and let the tagliarini rest for about 30 minutes before serving. Drizzle lightly with olive oil before serving. For a creamier texture, let the tagliarini sit for about half an hour before serving. Tagliarini with Beans is even tastier reheated the following day as the broth thickens. Please note that the nutritional information provided is approximate and will vary according to exact portion size. Fresh pasta and beans are true comfort foods and perfect for these colder days! Looks absolutely delicious Nadia! Thanks Marisa, it is a classic recipe that I've been wanting to preserve! Everything looks wonderful thank you so much for sharing. My nona would make all these wonderful dishes without any recipe , I tried to measure ingredients while she was making the dish but it never tasted like hers. Hello Annette, thank you very much for your lovely comment! I'm to this days still amazed how my mother can bake without measuring anything and relying on the palms of her hands to determine quantities. That is a talent that will be lost with her generation. That is why I'm taking the time to stop her and measure ingredients so we can pass on these precious recipes. 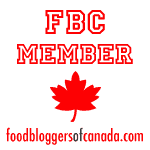 Thanks again for stopping by my blog! Nadia, the only difference I see is that my family uses garlic and yours uses onion. Either way I know it is delicious. I love the beans you call Romano, which I grow in my garden and the packet of seeds calls them shell beans. The wonderful thing about growing them is that they can be frozen right out of the pod, no other preparation needed, so I have a frozen supply to use whenever I wish. I have not made this dish in a long time since my chicks have flown the nest and my husband passed away 7 years ago but you inspire me to make it just for me. It is always good left over so I can enjoy repeat performances. My mouth is watering just thinking about it! Hi Anna, that's exactly what my mother used to do when they had a larger garden way back then. She and my dad would spend hours shelling them and freezing them so she could make this dish. Unfortunately that's no longer the case so we use purchased romano beans. You're lucky to have a frozen supply of beans! You should definitely make some for you especially since it is even better reheated! Hope you do and enjoy! I just wrote a comment which does not yet appear and realize I forgot to give the recipe a rating ... 5 stars for sure and if I could I would give it a ten. So incredibly kind of you Anna, thank you very much!